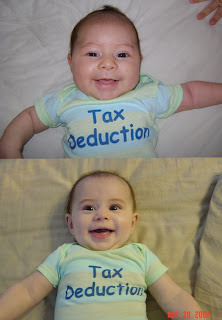 One of the great parts about having kids is the nice deduction you get come tax time. (Well it doesn't really compare to the money you spend on them throughout the year!) Anyway, someone gave us this onesie when Avery was a baby so I had to do a comparison picture. What's funny is Avery was 5 months old in the bottom picture and Bailey is only a little over 2 months! And this is a 0-3 month onesie! Bailey isn't really that chunky anymore, but she is obviously much chunkier than her sister was! Their newborn pictures look so much alike, but now I am starting to tell a real difference in their looks. It's fun to compare pictures. Here are some more pictures we took that day and a couple from another day.